Satellite measurements from high-resolution magnetic field mapping missions over almost a complete solar cycle have been used to investigate the variability of major magnetospheric currents during quiet times. As judged from near-Earth magnetic field observations, the magnetotail current system exhibits no long-term trend. Activity-dependent enhancements decay within hours. A suitable quantity to parameterize the temporal variation is the merging electric field, delayed by 60 minutes with respect to its value at the bow shock. Conversely, the ring current strength shows pronounced solar cycle dependences. We show for the first time that a solar cycle dependent bias has to be added to DST to represent the actual ring current strength. It ranges from −15 nT at solar maximum to zero at solar minimum. The scaled solar flux index, F10.7, delayed by 20 months, is found to be a suitable proxy for predicting the bias. This empirical result reflects no physical relation between F10.7 and ring current bias. A spherical harmonic model valid at Earth’s surface is presented that reflects the quiet-time magnetospheric fields. For high-resolution geomagnetic field modeling from data of low-Earth orbiting satellites, uncertainties in characterizing contributions from ionospheric and magnetospheric currents can be regarded as the prime limiting factor for the achievable accuracy. For satellites, the ionospheric currents generally represent internal sources. Large-scale magneto-spheric currents flow on the magnetopause. They include the Chapman-Ferraro (CF) currents on the sunward side, and they are part of the magnetotail current system on the night side (e.g., Hughes, 1995). Furthermore a magneto-spheric ring current circles the Earth, aligned with the geomagnetic equatorial plane. Large-scale field-aligned currents connect the various magnetospheric currents with the high-latitude ionosphere (e.g., McPherron, 1995). If vector field measurements are available over the complete surface of a sphere, then it is possible to uniquely distinguish between (1) internal poloidal fields from sources below the satellite (e.g. core, crust, E-region currents), (2) toroidal fields due to field-aligned currents passing through the orbital plane, and (3) poloidal fields flowing entirely above the satellite orbit (e.g. magnetospheric currents). We make use of this important property of spherical harmonic (SH) analysis to derive a model of the external poloidal field, which reflects typical characteristics of magneto-spheric current systems. Our analysis is limited to quiet times (Kp < 3) because of their relevance for modeling Earth’s internal magnetic field. It has been recognized for quite some time that currents in the inner magnetosphere (i.e. the ring current) are well described in the solar-magnetic (SM) frame. In that frame the z axis is parallel to the geomagnetic dipole axis, pointing northward, the y axis is perpendicular to the plane defined by dipole axis and the Sun-Earth line, points toward dusk and x completes the triad pointing sunward. Currents in the outer magnetosphere are better organized in geocentric-solar-magnetospheric (GSM) coordinates. In that case the x axis points to the sun, the y axis is perpendicular to the plane defined by the x axis and the dipole axis, pointing duskward, and z completes the triad, pointing northward. For an efficient description of the external magnetic features it has recently been proposed to separately expand the contributions in SM and GSM coordinates (Maus and Lühr, 2005; Olsen et al., 2005). A reliable separation between field variations in the GSM and SM frames is not simple but, it is achievable. The orientation of the two frames differs by up to ±34° during the solstice seasons. For a reliable separation, at least one year of data has to be analyzed. a field component along the ZSM axis varying as 0.8 ∙ EST, the external part of the DST index. In addition, all the magnetic effects due to induction in the Earth have been considered. Presently this kind of parameterization is widely accepted in the main field modeling community, and it is employed, for example, in model families such as CHAOS (CHAMP, Ørsted, SAC-C) (e.g., Olsen et al., 2006) and Pomme (e.g., Maus et al., 2006). In recent years it has become increasingly evident that the model of ML (2005) has to be updated in order to better represent the present magnetospheric field under solar minimum conditions. It has been suggested that the constant terms in items 1 and 3 (above) may show some secular variation. In this study we make use of 9 years of CHAMP magnetic field measurements to check the time dependence of the magnetospheric contributions. In the second step suitable proxies are investigated that can be used for parameterizing the temporal changes of the magnetospheric fields. Prime data sources for this study are the CHAMP vector and scalar magnetic field measurements. They are fully calibrated and available under product identifier CH-ME-2-FGM-NEC and CH-ME-2-OVM, respectively, from the Information and Science Data Center (ISDC) at GFZ in Potsdam. The employed data interval starts immediately following the launch of CHAMP, 15 July 2000, and lasts until the end of August 2009. Therefore the entire time span, from the peak of the solar cycle to the present deep minimum, is covered. Ørsted data are used for validation purposes. Magnetic field vector data are considered from July 2000 until November 2005 sampled by that spacecraft. Since vector data become progressively sparse after July 2002, Ørsted scalar data from July 2002 to June 2009 are also taken into account. For main field modeling, data is commonly selected from periods of low magnetic activity. We therefore exclude storm times from our study. Data were selected from periods when the magnetic activity index, am, was less than 15 (Kp < 3) and the previous 3-hour interval had am < 18. Rapid variations of magnetospheric currents on time scales of the orbital period (1.5 h) are excluded from such a dataset. Furthermore, data from orbits showing abnormal signatures were discarded. No selection with respect to solar wind, IMF or DST conditions was performed. The index am is an alternative version of ap (for details see Menvielle and Marchaudon (2007)). where the resulting temperature is in Kelvin (K) and LT represents the local time in hours. To Estimate the coefficients describing the magneto-spheric field, we make use of a spherical harmonic expansion by solving simultaneously for coefficients in the GSM and SM frames. Since satellites sample the sphere more densely near the poles than at the equator, an equal-area data weighting is performed prior to the least-squares inversion. Subsequently we make use of the SHA property to derive the coefficients of an external poloidal field. The magnetospheric field model derived from CHAMP data has the same structure as the one presented by ML (2005). Due to the longer data interval, time dependences can be investigated. We have used two different approaches to describe the temporal variation of the external field. First we derived the mean magnetospheric contribution from an independent inversion for every year. Subsequently we fitted all data in a single run, accounting for temporal variations over the 9 years by an appropriate parameterization. One prominent result of ML (2005) was the identification of a stable coeff (1,0) magnetic field of about 13 nT in the GSM frame. When considering the full span of 9 years of continuous CHAMP recordings, it becomes evident that the GSM field shows no solar cycle dependence. Figure 1 displays the yearly results. The crosses with uncertainty bars represent the annual means of the negative ZGSM component. They vary around 8.5 nT without exhibiting any trend. Long-term variation of magnetospheric field component in GSM coordinates. Annual means of the −ZGSM component as derived from CHAMP data (crosses); model prediction of the −ZGSM component (full line). Error bars reflect the RMS difference between CHAMP and Ørsted annual means. Simultaneously, the annual means of the external field (coeff (1,0)) aligned with the negative Zsm component are calculated. Results are presented in Fig. 2 as plus signs with error bars. This quantity shows major solar cycle dependence. Large annual means up to 17 nT are obtained during the years 2001 through 2005; subsequently they decay to 2 nT in 2009. An interpretation in terms of magnetospheric currents will be given in Section 4. Breakdown of the parts contributing to the uniform field in SM coordinates. The observed annual mean values of SM fields are presented as plus signs. The model estimate of the −ZSM component is drawn as thick curve. 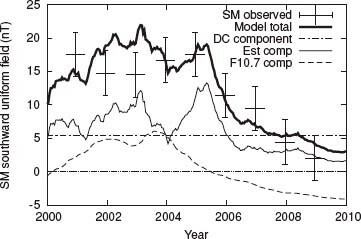 This is composed of a constant bias (dashed-dotted), an Est dependent component (thin line), and a solar cycle dependent component approximated by the F10.7 index delayed by 20 months (dashed). A widely accepted approach is the parameterization of the various external field sources by suitable parameters. In the case of the SM field, Maus and Weidelt (2004) proposed the Est index (external part of Dst) as a suitable proxy for describing the temporal changes of the ring current effect. In addition, a bias value has to be considered, reflecting the magnetic effect of the quiet-time ring current (for Est = 0). The annual means shown in Fig. 2 suggest that the bias can no longer be considered as constant when analyzing a 9-year interval. In order to obtain a continuous description of the nearEarth external field, we have introduced a number of controlling parameters for the SM and GSM models. Scaling and temporal shift of these parameters are optimized by minimizing the difference between model prediction and satellite observations. The SM model (mainly coeff (1, 0)) is controlled by three different entries. Time variations (order of days) are accounted for by a parameterization with the Est index. The strength and variation of the Est-related part is plotted in Fig. 2 as a thin line. This curve is systematically below the annual means. To reconcile the model with the observations, we tested several solar cycle dependent functions that could represent the time-variable bias. Promising results were obtained using the solar flux (F10.7 index) delayed by about 20 months, for parameterizing the second part (dashed curve). The third part is a constant bias (dashed-dotted curve). Determination of optimal lag time by plotting the root mean square (RMS) of the effect that can be explained by the model. (top frame) The F10.7 index is used as a proxy for the bias of the uniform SM field. Best results are obtained when the F10.7 index is delayed by 18 to 22 months. (bottom frame) The model parameterization is optimal when IMF B y is delayed by 35 min and the merging electric field, Em, by 60 min with respect to IMF observations at the bow shock. where the solar flux values have been centered about their mean value, F10.7 = 120 sfu. where Em is in mV/m. where is in mV/m. 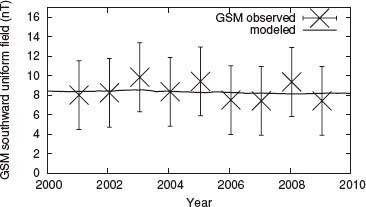 The temporal evolution of the modeled GSM coeff (1, 0) is plotted in Fig. 1 as a full line. No trend emerges. In this study we also confirm the partial penetration of the IMF B y field to the Earth’s surface. The scaling factor 0.26 confirms earlier results (e.g., Lesur et al. (2005); ML (2005)). 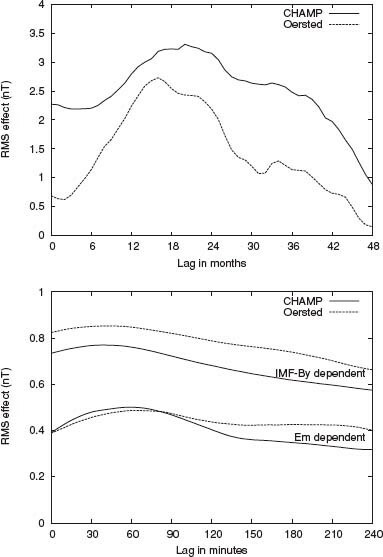 A new element is the optimal delay of 35 minutes with respect to the IMF reading at the bow shock (see Fig. 3, bottom). This new parameterization allows the external field contribution to be modeled more reliably over long periods. Details of the SHA coefficients used in this model are compiled in Table 1. For comparison, the most appropriate coefficients derived from independent Ørsted data are added. In general, the coefficients from both satellites and both orbital altitudes agree reasonably well, supporting the reliability of our model. We believe that the CHAMP observations are more suitable for separating the fields in SM and GSM frames, partly because of differences in orbital dynamics. It takes Ørsted almost 4.5 years to precess through all local times, compared to only 261 days in the case of CHAMP. List of external SHA coefficients (in nT) for modeling the near-Earth magnetospheric field. Coefficients derived independently from Ørsted data are shown for comparison. The evaluation of continuous magnetic field recordings from satellite over 9 years has revealed new features of magnetospheric field contributions. These features are of concern for main field modelers. In this section we interpret the modeled magnetic fields in terms of currents. In ML (2005), variations in GSM coordinates had been related to the far-field effect of the tail lobe field, and field contributions in the SM frame were related to the ring current plus the Chapman-Ferraro currents. An important result is the time-dependent bias of the Dst (EST) index. This means that the Dst value underestimates the actual field produced by the ring current by a varying amount, ranging from 0 to 15 nT depending on solar cycle phase. The observatory baseline, which is used for Dst estimation, is obviously contaminated by the slowly varying quiet-time ring current field. Previous modeling studies based on observatory data may have suffered from this imperfection. According to the Dressler-Parker-Schopke theorem, the total energy of the particles in the ring current is proportional to the magnetic field effect at the Earth’s surface. According to Eq. (2), at very low solar flux (e.g. F10.7a = 60) and vanishing Est (DST) value the ring current practically disappears. Satellite missions such as Cluster and/or THEMIS should be used to verify the ring current decay during this deep solar minimum. To parameterize the solar cycle dependence of the Est (DST) bias, the solar flux index F10.7a was used here. No direct causal dependence between the two quantities exists. Therefore, F10.7a is probably not the most suitable choice. Significant differences between the observations and the model curve (heavy line in Fig. 1) appear for the years 2002 and 2003. The obtained relationship is probably only valid for solar cycle 23. Thus, the search for a more appropriate parameter reflecting the quiet-time ring current field should be continued. Another important finding of this study is the long-term stability of the contribution in GSM coordinates. Variations of the field strength aligned with the ZGSM component occur on time scales of hours. We identified the merging electric field as a suitable parameter for describing the short-term variability outside of magnetic storms. The derived time-delay for Em of 60 minutes with respect to conditions at the bow shock, when parameterizing the ZGSM field variations, supports the suggestion of ML (2005), namely, that the field in the GSM frame is primarily caused by tail currents. This implies that no solar cycle dependence of the average tail lobe field could be deduced. The magnetic field generated by Champman-Ferraro currents likely ends up as part of the SM component. From Eq. (5) we see that close to Earth a GSM field of 8.3 nT is found for Em = 0.5 mV/m. This result is smaller than the stable GSM value of 12.9 nT mentioned by ML (2005). Part of the difference can be explained by the higher merging electric field during the years 1999–2004, but some 3 nT remain unexplained. Olsen et al. (2005) also presented a decomposition of the external magnetic field in SM and GSM parts. Their reported value of 8.3 nT for the GSM field agrees fully with the value presented here. In summary, important features of magnetospheric fields, as observed close to Earth, have been inferred in this study. Solar cycle dependences of the magnetospheric ring current and tail currents were deduced. A new time-dependent SHA model characterizing the different quiet-time magnetospheric contributions has been presented and is available as part of the software of the Pomme-6 model at http://geomag.org/models/pomme6.html. The European Space Agency’s upcoming multi-satellite mission Swarm should be used to develop improved magnetospheric current indices, complementing Dst. The CHAMP mission is sponsored by the Space Agency of the German Aerospace Center (DLR) through funds of the Federal Ministry of Economics and Technology, following a decision of the German Federal Parliament (grant code 50EE0944). The data retrieval and operation of the CHAMP satellite by the German Space Operations Center (GSOC) is acknowledged. The Ørsted Project was made possible by extensive support from the Danish Government, NASA, ESA, CNES and DARA.